The incident, which occurred last fall at a South Carolina high school, was captured on a student cell phone and quickly went viral. In the midst of widespread public outrage, the deputy was fired, his forceful response deemed “excessive” by both the sheriff’s office and school officials. The 16-year-old girl, who had disrupted class and allegedly struck the police officer, was arrested on a charge of “disturbing schools.” An investigation into the incident is ongoing. The incident incited a public debate concerning the role of police in our schools. Should officers involve themselves in routine disciplinary matters? How forceful should they be with nonviolent students? Does the intervention of police unintentionally criminalize student misbehavior? And are the arrests of students contributing to what some call the school-to-prison pipeline? In seeking answers, school safety experts say it’s important to remember that thousands of police officers—often called school resource officers (SROs)—work in schools every day without incident, and their presence can be a positive influence on students and their schools. Mo Canady, executive director of the National Association of School Resource Officers (NASRO), says incidents of poor judgment by police officers are very much an anomaly. For urban school leaders, the issue isn’t whether questionable incidents between students and police are uncommon. It’s how to ensure they don’t happen at all. When schools and police aren’t paying enough attention, the decisions of educators and officers can lead to practices where police play too active a role in the school setting and, on occasion, enforce discipline with an uncomfortable degree of force. In some urban districts, for example, school-based police regularly issue tickets to students for misbehavior that need not be criminalized. Texas Appleseed, a public justice watchdog group, has claimed that, in years past, some ticketed offenders in Texas have been as young as 4 years old, and arrest warrants have been issued for students who failed to pay fines or to appear in juvenile court. The use of force against students also has come into question. In Virginia, a disruptive but unarmed 14-year-old middle school student was tasered by police earlier this year. A 4-year-old who threw a temper tantrum ended up in handcuffs and hauled to the sheriff’s office in a squad car. In Alabama, the Southern Poverty Law Center went to court to challenge the use of pepper spray in schools -- a practice lawyers claimed was sometimes used for “crowd control” and not simply to subdue violent offenders. No one is denying the need to keep schools safe, nor do many wish to second-guess a police officer’s need to act decisively and, if necessary, forcefully when confronted with a violent situation. While they are the safest place for a child to spend the day, schools are not immune to the violence and criminal activity that plagues urban communities. Police do have a role in the schools. The real issue is striking a balance in that role, school safety experts say. The job of police is to keep schools safe—not to enforce a school’s discipline code or help a teacher with a classroom management problem. Robert Mock, chief of police for the Houston Independent School District, says a good rule of thumb is that, if a student’s behavior isn’t a violation of law, police shouldn’t be involved. That sounds simple enough. But, human nature being what it is, it isn’t hard for faculty and police to start blurring the lines. Students misbehave, sometimes with a defiance that can be shocking, and it’s easy for a teacher to call for assistance -- or an officer to step forward to maintain order. A few years ago, Houston officials had to “pull back” on practices that saw police being too hands-on in school disciplinary matters, Mock says. Decades before the Columbine and Sandy Hook shootings raised public concerns about school safety, the role of SROs was primarily conceived as a way to foster a positive relationship between local police and young people. A police officer usually showed up at school to talk to students about the role of law enforcement, offer a warning on the dangers of drugs, or coach a sports team or mentor a troubled youth. That was the original intent, at least. Over the next half century as school crime rates rose and unthinkable acts of violence became an all-too-real threat, a police presence in school became increasingly common -- and its focus increasingly turned to maintaining the safety of students and teachers. Today, the National Center for Education Statistics estimates there are more than 43,000 police officers and 39,000 security guards working in the public schools. 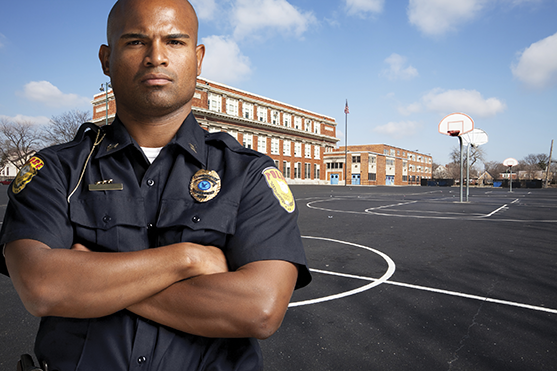 Yet, while school safety can dominate the thinking of school-based police and school officials, school leaders aren’t ready to abandon the more traditional and educational role that an SRO can play. Among those leaders is Micah Ali, president of the board in trustees for California’s Compton Unified School District. As the school district operates its own police department, the school board has made its expectations known—that officers will continue to be involved in a variety of educational endeavors, such as drug prevention and anti-bullying programs, as well as providing informal counseling and mentoring to students. That’s not to say school police are any less diligent in protecting schools from violence or criminal activity. But, in some school districts, police are working with school leaders to curb arrests and prosecutions—and avoid introducing students to the juvenile justice system. The Philadelphia Police Department recently rethought police practices in the schools—reaching out not only to the school system but also to other city agencies, the court system, and the offices of the public defender and district attorney. The result was the development of a “delinquency diversion program,” where students are provided counseling or other interventions as an alternative to being arrested for minor or first-time criminal offenses. In its first year, the program cut the number of student arrests in half. The police department and school district also agreed that police would not intervene in verbal disputes, minor disciplinary problems, or classroom management issues. To make certain that everyone is on the same page, school safety experts say school boards should set a clear policy. If the district is working with an outside law enforcement agency to provide police officers, there should be a memorandum of understanding about how this partnership will work. Part of that understanding, says Curtis Lavarello, a former SRO and executive director of the School Safety Advocacy Council, should spell out “the times when an officer shall be called -- and not called” -- to a classroom. Just as important for a well-functioning police presence in schools is recognition that not every police officer is suited to the unique demands of being an SRO. The Houston Independent School District also operates its own police department, and as an indication of the district’s high standards, it hired just two officers out of 250 applications, Mock says. When working with an outside agency, some school safety experts say school officials should have a discussion about the selection criteria for assigning police. Experience and temperament are important, but just as critical is the training that officers receive before they start walking school hallways, experts say. To work effectively with young people, officers need specialized training on the officer’s role in counseling, mentoring, and educating students, and how to de-escalate a tense situation. NASRO requires 40 hours of basic training, and it recommends continuing training over the years, Canady says. Some school districts mandate 30 to 40 additional hours every year. Topics covered in the training include conflict resolution, dealing with students in trauma, educating students in drug prevention, counseling, and identifying children and referring them to interventions. In Houston, school police are constantly reviewing the effectiveness of their training, as well as the efficacy of their policies and practices, Mock says. For example, all serious incidents involving officers are reviewed with the goal of improving future responses and training. But, while a well-trained officer often can resolve conflict, it’s important that a school district train its teachers and principals to handle these situations themselves -- and feel less need to call in the police. In Compton, the district provides “conflict prevention intervention” training that provides specific techniques to help staff with classroom management, conflict resolution, and de-escalating a potentially disruptive situation. Training also should prepare principals to maintain a constant and open dialogue with officers in their schools, so that as situations arise, principals are better prepared to coordinate the appropriate response, says Michael Allison, principal of Hopewell Senior High School in Aliquippa, Pennsylvania, and president of the National Association of Secondary School Principals (NASSP). When he was a young principal, Allison participated in the same training as the police officer newly assigned to his school. That experience greatly aided his understanding of the role of school-based police, he says, and the joint training facilitated a well-understood working relationship with his officer. Once all the pieces are in place, a district is better positioned to keep its schools safe -- and also ensure that the role of school police is more positive and student friendly. But Ali says the school board must take the lead, making its expectations clear in its policy and directives, and it must demand accountability. Do school leaders and law enforcement officials agree on the role of police in the school district—and is that role clearly communicated to teachers, administrators, and police officers? Are the officers who are assigned to schools selected for their temperament and ability to work with young people, and are they receiving specialized training to prepare them for their unique role of serving in the schools? Do teachers and principals receive extensive training in classroom management and handling disciplinary issues so they can handle misbehavior themselves, and are they given clear guidelines on when to request police assistance?